Remember that the Keuka Comfort Care Home doesn't charge residents or their families to spend their final days in its beautiful home surrounded by compassionate volunteers and staff. This is only possible because of supporters like you and your friends and neighbors who step up to support you in Krossin' Keuka. Please keep this in mind as you go about asking for pledges. Go the extra mile (out of the water) with your donation requests! Wear a button that says "Ask me about Krossin' Keuka"
Post on all your Social Media Pages! Post a Krossin' Keuka poster in your workplace or at your service organization and attach a note asking your co-workers to sponsor you. Ask your bridge club, book club, coffee group, etc. to sponsor you as a group. Hand out stamped envelopes addressed to the Keuka Comfort Care Home. Your supporter can enclose their check and mail! REMEMBER: YOU'RE NOT ASKING FOR YOURSELF; YOU ARE ASKING FOR A VERY WORTHY CAUSE! Matching Gifts — Some companies have matching gifts that double or even triple the initial donation — check with your Human Resources Department. Collect the donation when you ask for it. It will be easier for you if you collect as much as possible at the time you request the donation. Emphasize the tax–deductibility of donations. People are often interested in getting a tax deduction "in return" for their donation. Their cancelled check can serve as a receipt. Everyone you have an e-mail address for! Your online sponsorships will appear on your personal sponsorship page automatically. If you receive sponsorships in the form of checks or cash, we will enter these items on your sponsorship page when they are received at KCCH. 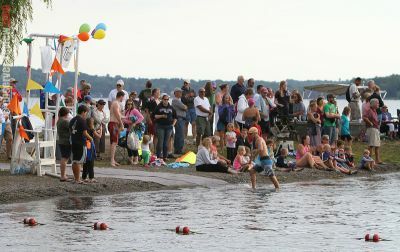 with other swimmers and paddlers to benefit the Keuka Comfort Care Home. here in Penn Yan. I hope you will join me in supporting the home. to these residents or families. Krossin' Keuka, c/o KCCH,  PO Box 107, Penn Yan, NY 14527. Please write my name on the memo line of your check. worthy cause and thank you for considering this request.